Pope Shenouda III (3 August 1923 – 17 March 2012) was the 117th Pope of Alexandria & Patriarch of the See of St. Mark. His papacy lasted for forty years, four months, and four days from 14 November 1971 until his death on 17 March 2012. 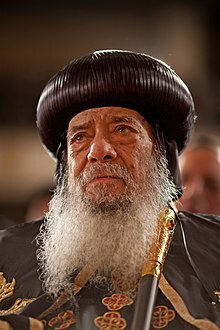 Pope Shenouda III died on 17 March 2012 in Cairo, Egypt from respiratory and kidney failure, aged 88. ↑ "Pope of Egypt's Coptic Christian Church dies". USA Today. 17 March 2012. Retrieved 17 March 2012. ↑ "Egypt's Coptic Christian Pope Shenouda III dies". BBC. 17 March 2012. Retrieved 17 March 2012. ↑ "Egypt Coptic Christian Pope Shenouda III dies: adviser | Top News | Reuters". Af.reuters.com. 18 March 2012. Retrieved 18 March 2012. This page was last changed on 20 June 2018, at 03:49.